Bob Vanourek is a friend and author in the area of leadership and trust. He and his son Gregg have written an outstanding book on leadership that I had the pleasure of reading recently. As a leadership and trust author myself, I have the opportunity to review scores of books each year as part of my research and to give testimonials for the true gems. Bob and Gregg have produced a classic! 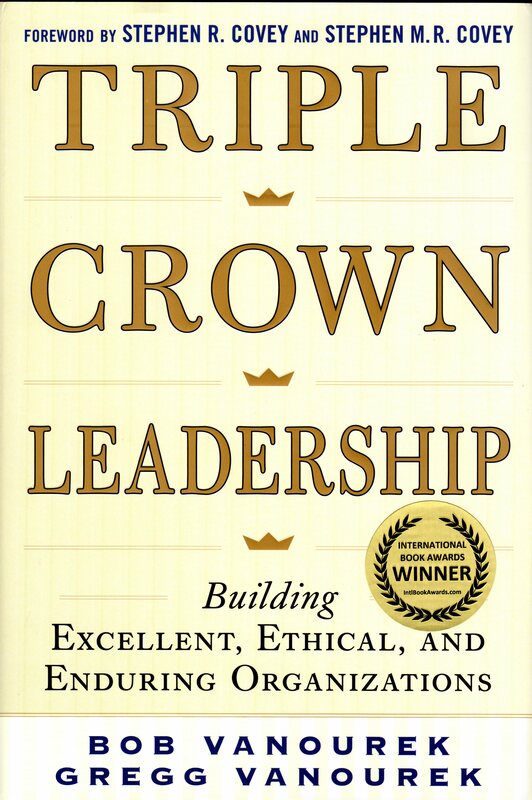 If you are interested in a pragmatic “how to” book for becoming an elite leader, you owe it to yourself to invest in a copy of Triple Crown Leadership. Bob and Gregg draw on decades of experience in the leadership trenches and the boardrooms of business. They have seen and done it all, and have enumerated the triple crown concepts of how to build an organization that is Excellent, Ethical, and Enduring. The book uses the analogy of Triple Crown Horseracing to signify the top of the racing profession and equate the relevant principles to the business world. It is a fascinating and captivating metaphor. 1. Head and Heart – How to combine brilliant strategy with the human touch. 2. The Colors – How to always race on a track with a firm foundation of values, vision, and purpose. 3. Steel and Velvet – Gaining that rare combination of firmness when needed coupled with deep care for people. 4. Stewards – How to empower others to lead. 5. Alignment – Creating a culture where all individuals are going in the same direction on the track. The book is rich with dozens of real examples unearthed by years of research where Bob and Gregg interviewed leaders in 61 organizations in 11 countries. This book has it all, and the writing is easy to digest and absorb. If you are a leader and aspire to the pinnacle of the profession, I highly recommend this book. It belongs in the stable of every serious leader’s books. This entry was posted on Wednesday, November 6th, 2013 at 7:49 am and is filed under Candor creates trust, General blog information, leadership, Organization, Trust, Trust and motivation, Trust and respect. You can follow any responses to this entry through the RSS 2.0 feed. You can leave a response, or trackback from your own site. Sherita. I am confused by your comment. There was no video associated with this blog entry. off valuable information, thanks ffor providing such information. much effort you place to make any such magnificent informative web site. viddo clips too give your posts more, “pop”! Youur content iis excellent but with pics and video clips, this site could definitely be one of the best in its niche. Yes, I sometimes do include videos graphics and other art work. I should do more of it. Something to do with the shortage of time.